When people ask what my favorite movie is, I always respond with Diva. 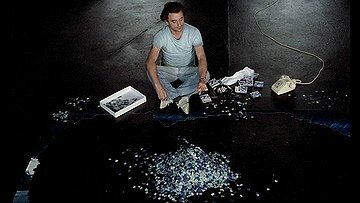 I had seen it several times years ago in college and was completely entranced by this French art film. Besides the intricate plot, beautiful engaging characters, and breathtaking vistas, it also had two of my favorite things, classical music and jigsaw puzzles. Of the characters, I loved Jules (Frédéric Andréi) for his true passion for the lovely diva Cynthia Hawkins (IRL singer Wilhelmenia Wiggins Fernandez). I’ve been an obsessive fan of singers and musicians myself (maybe not that that degree, but I may have left a love struck note on the desk of a baritone’s dorm room once). Whenever I hear the aria “Ebben? Ne andrò lontana”, from Catalani's opera “La Wally”, it still sends chills up my spine. There is also the cute French-Vietnamese Alba (Thuy An Luu) who roller skates in the vast loft of Gorodish (Richard Bohringer), part Zen master, part mastermind. I'm a sucker for bathtubs and roller skating as well. I loved the huge jigsaw puzzle of a wave that Gorodish completes so much, I requested this 12,000 piece puzzle as a gift for myself several years ago. One day I will clear out the entire living room to the wood floor, and work on the puzzle for months in a Zen-like state. Perhaps I will roller skate around while I ponder the pieces (no, my living room is not that big). The kids would have to be MUCH older of course because there is no Zen in my house these days. Can you imagine Michelangelo’s Creation of Adam spread 12 feet across the floor? 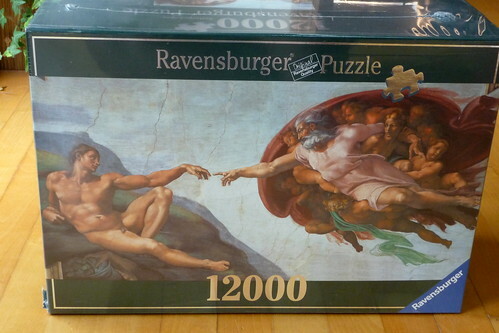 It will be pure jigsaw puzzle bliss (or hell) someday! I recently purchased a used copy of the Anchor Bay version of Diva . Supposedly, the Meridian version of Diva was remastered in 2008, but the original was so horrible that I didn’t want to chance it, especially with reviews like this. The Anchor Bay version did not disappoint. Doug and I watched this old film together (his first time). How did it hold up after all this time? Some of the film is very dated. The plot would not hold up in today’s world of cell phones. But the music is timeless and the cinematography is still magnificent. Doug liked Gorodish’s character and Jules still charms me every time. Is Diva still my favorite movie? Well until a movie comes out that has classical music, jigsaw puzzles and is that cool, it still is. And yes, I can be hopelessly 80’s. This is the first time I listened the singing of aria, beautiful! I had the feeling of sadnes but not chiling from singing. You must know the verse of song. Enjoy making your 10,000 piecies of "Creation". I like your "old fashioned candie store" made from one thousand pieces of puzzle that I bought for one $1.00. Whenenver I feel that I miss you, I look at the puzzle. I went to another You Tube to find the verse of "Aria'. It is poetic and beautiful, not sad nor chilling. Now I remembered that I listened this song before more than once. I tend to go over these beatiful peice of music superficially without get into detail. Thank you for posting your "Diva". Cynthia Hwwkins is enchating, I love the way she sang the sound, withe her lips rounded like "Dova"s kissing lips". Freddreic Andre is adorable. I would like to see the movie when I get chance. I love jigsaw puzzles too! I used to love having one going all the time. The movie sounds quite fascinating...I might have to check it out sometime!